With the support of his vulnerable girlfriend, Bonnie Parker, and two Texas nobodies who shared his dreams of taking a major bank score, Clyde set out for the Farmers and Miners Bank in Oronago, Missouri on November 30, 1932. Bonnie had already visited the bank the previous day to case it, but the inexperienced girl drew only suspicious stares from its employees rather than a master plan for robbery. Undeterred by her lack of success, Clyde loaded his Browning Automatic Rifle – stolen from a Texas National Guard armory three months earlier – and charged into the bank around 11:30 a.m. with accomplice Frank Hardy. Things didn’t quite go according to plan. Instantly, 60-year-old cashier R.A. Norton recognized the thieves and sounded the alarm, drawing his own gun and firing at Clyde from behind a thick layer of protective glass. Clyde fired back in vain with his BAR, unable to penetrate the glass despite Norton’s gun jamming. The opportunistic and mission-minded Hardy grabbed about $110 from a table in the cubicle but managed to cut his hand on the glass shattered by Clyde’s wild gunfire. Outside, Oronago town residents armed themselves and fired upon the robbers from a barricaded garage. Amidst gunfire from all directions, Clyde and Hardy jumped into the getaway car driven by fellow accomplice Hollis Hale. Hale sped them out of town to where Bonnie was waiting in a second getaway car. After splitting the meager earnings, Hardy and Hale parted ways with Barrow. Clyde’s bumbling attempt in Oronago was likely not his first bank robbery; allegedly, he had pulled one off under the leadership of Raymond Hamilton and Ralph Fults that March in Lawrence, Kansas. Now, Fults was back in custody and Hamilton – whom Clyde hated – was well-known through Texas as an efficient bank robber. Likely envious of Hamilton’s success in the face of his own dismal failures, Clyde was determined to lead a gang of dangerous desperadoes. Unfortunately, all he had was his nervous girlfriend and any small-timer dumb enough to come along with him. The next spring, Clyde actually managed to recruit a more experienced criminal into his gang… his older brother Marvin, better known as “Buck”. Though the 1967 film Bonnie and Clyde shows this “Barrow Boys” gang as rousingly successful at bank jobs, the brothers likely only committed one major bank robbery during their time together; needless to say, it wasn’t very successful either. One night in May 1933, Bonnie and Buck’s wife Blanche drove up to the Lucerne State Bank in Lucerne, Indiana in a stolen Ford V-8, Clyde’s favorite car. Clyde and Buck emerged from the car, armed with their submachine guns (or BARs, more likely) and broke into the bank, where they hid until morning. At 7:30 a.m., bank employees Everett Gregg and Lawson Selders were surprised by the two hidden men who ordered them to put their hands up. Luck was against the Barrow boys that morning as Gregg retrieved his rifle from behind the cashier’s desk and shots were again fired. The empty-handed Barrow men ran out of the bank and jumped into the Ford, where Clyde took the wheel from Bonnie. As in Oronago, the townspeople fought back, including an old man who leapt onto the hood. Allegedly, Bonnie refused Clyde’s order to shoot him as he was “white-headed” but some reports state that Bonnie fired a few wild shots that scared him off. In any case, the gang had left town empty-handed and with a few casualties in their wake as townswomen Doris Minor and Ethel Jones each received minor wounds. Two fatal casualties were two pigs being herded across the road before Clyde plowed them with his getaway Ford. 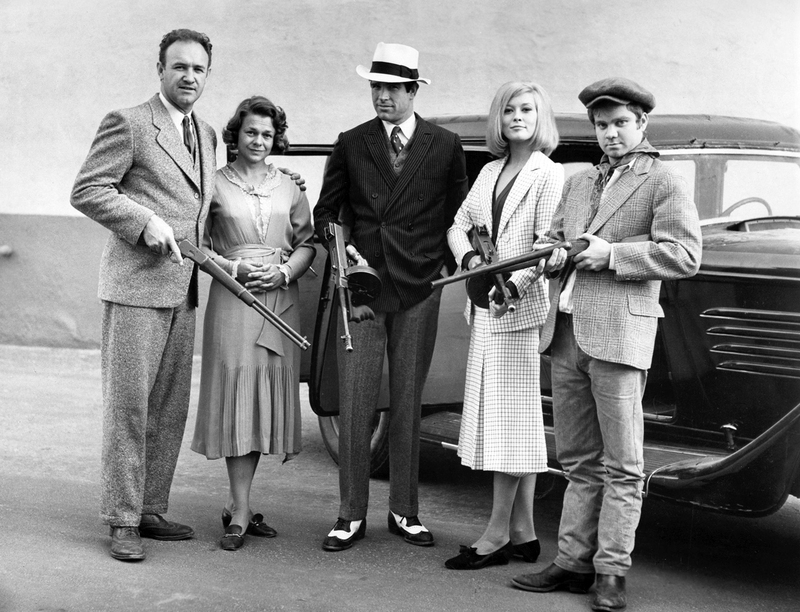 The “super gang” cast of 1967’s Bonnie and Clyde: Gene Hackman, Estelle Parsons, Warren Beatty, Faye Dunaway, and Michael J. Pollard. 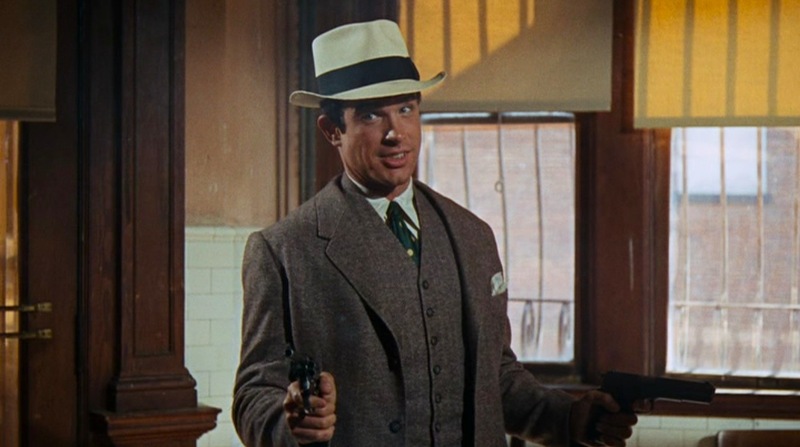 All are dressed from the bank robbery scene featured here, but Clyde has inexplicably replaced his herringbone suit coat with the dark blue double-breasted pinstripe coat from his other suit. 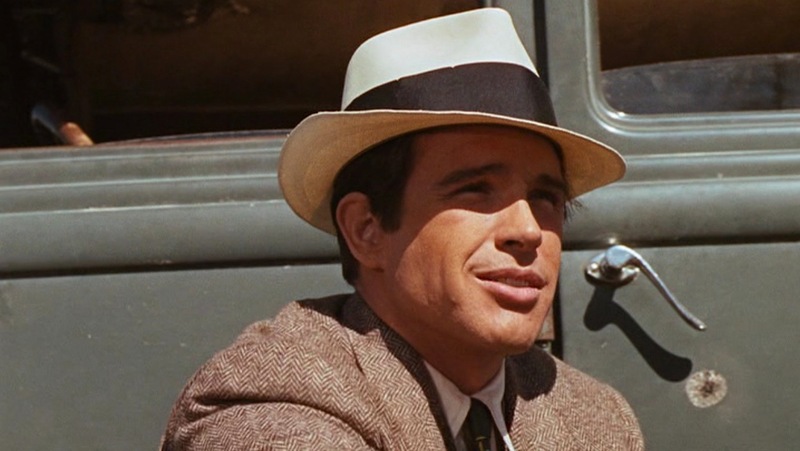 Thus, the criminal career of the real-life Barrow boys came nowhere near the efficient “super gang” seen portrayed by Warren Beatty, Faye Dunaway, Gene Hackman, and Estelle Parsons (as Clyde, Bonnie, Buck, and Blanche, respectively) in the film. The gang’s fifth member, W.D. Jones (renamed “C.W. Moss” and played by Michael J. Pollard in the film), was absent for the failed Lucerne job. In fact, he had gotten characteristically lost from the gang after kidnapping a couple in Louisiana, not to rejoin them until early June just before Bonnie’s near-fatal car accident outside Wellington, Texas. Clyde finally would become the leader of a semi-competent bank-robbing gang the next year after freeing several inmates, including his old enemy Raymond Hamilton and the eventual turncoat Henry Methvin, from the Eastham prison farm on January 16, 1934. When the gang hit a bank in Lancaster, Texas a month later, Clyde ensured that all of the men were properly duded up in new suits and overcoats. It was likely this robbery that served as the inspiration for Bonnie and Clyde‘s cool bank job as this was the instance where Clyde told a poor farmer, “We don’t want your money, we just want the bank’s money.” It was obvious that Clyde’s new idol was criminal celebrity John Dillinger, who had just uttered those words a month earlier during an East Chicago bank robbery. 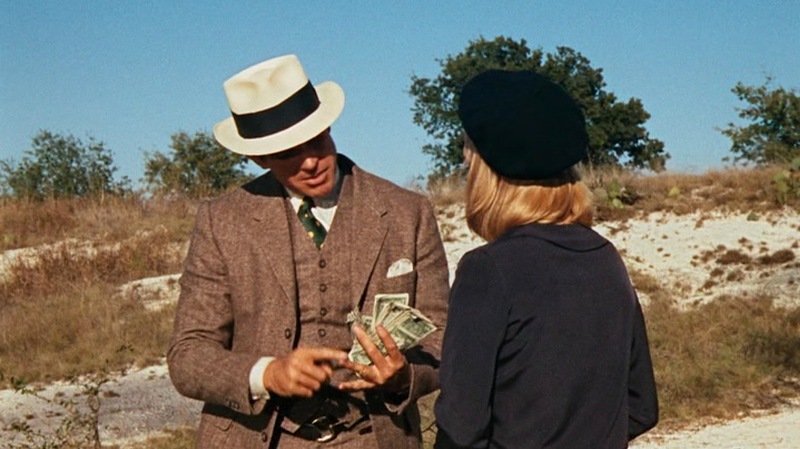 The Lancaster bank job netted Clyde’s largest score, possibly around $6,000, but it wasn’t enough to keep the gang together. Soon, Hamilton and his girlfriend would skedaddle after a showdown with Clyde, and Methvin and his family decided to turn his famous accomplices in to the police. Three murders and less than three months later, Bonnie and Clyde would lie dead on a lonely Louisiana road. Clyde dresses up for the robbery, sporting a new brown and cream herringbone tweed suit that blends to form a solid brown appearance from a distance. 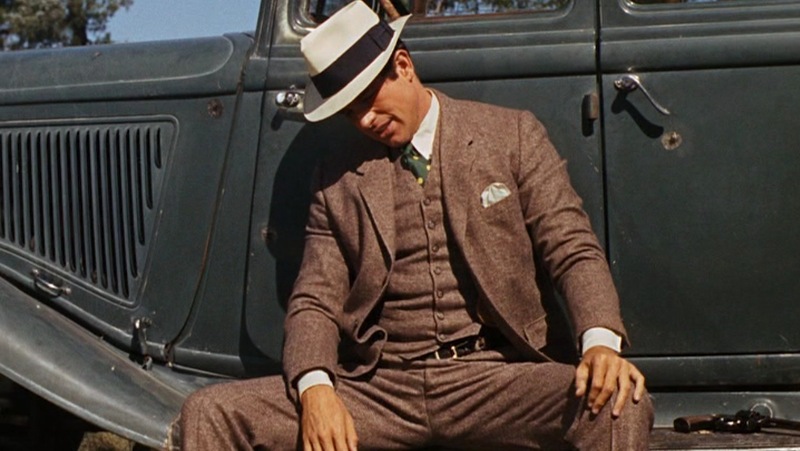 Although the styling of the suit makes it perfect for a 1933 gentleman, the choice of a tight weave like herringbone in a heavy cloth like tweed is curious for a hot Texas summer day where Clyde is jumping in and out of poorly-ventilated cars. Clyde, basking in the after-glow of a successful bank heist. The suit jacket is single-breasted with slim notch lapels and a three-button front that Clyde leaves open throughout the sequence. It has padded shoulders, roped sleeveheads, and 3-button cuffs. Clyde takes command of the situation. One of the most distinctive aspects of the jacket is its “action back” with a bi-swing shoulder pleat behind each shoulder to allow more arm movement as well as a half belted waist. Many “action back” jackets also feature a center pleat, but Clyde’s does not. The “action back” is best seen utilized when Clyde tosses the bag to Buck during the robbery. Clyde’s jacket has a single rear vent under the belted waist. Though the fabric and styling is very reminiscent of a country jacket, Clyde’s suit coat retains the traditional elements of a business suit with its straight flapped hip pockets and a welted breast pocket, in which Clyde stuffs a white linen handkerchief. Additional stifling in the heat, Clyde wears a high-fastening matching vest with the suit. It is single-breasted with a notched bottom and seven buttons down the front, all of which he buttons. 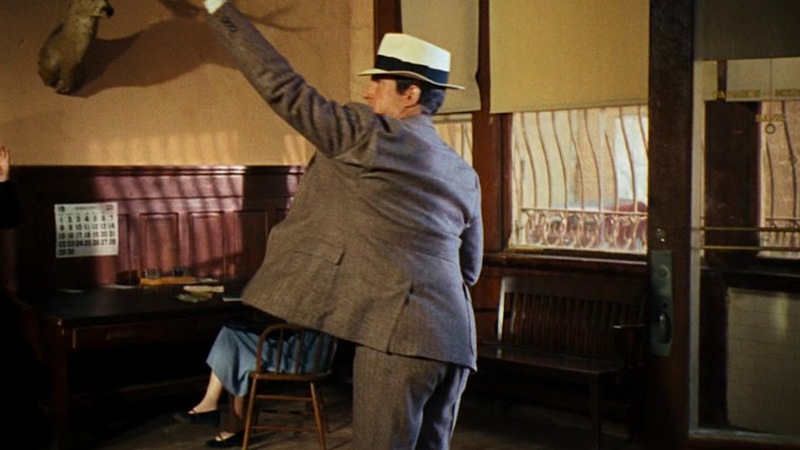 It’s okay for a tall guy like Beatty to have a 7-button waistcoat, but he should still leave the bottom button undone to avoid “bunching”. The real Clyde, who only stood around 5’6″, could not get away with wearing a 7-button vest. The film Clyde’s vest also has four welted pockets – two upper and two lower – and a dark brown silk-lined back with no adjustable strap. Clyde’s flat front trousers, like the rest of his suit, are very appropriately styled for the 1930s with their short break cuffed bottoms (with turn-ups, if you will). They have slanted side pockets and jetted rear pockets that both close with a button. Although many say that three-piece suit trousers should be worn with suspenders or side-adjusters rather than a belt, Clyde needs a belt in order to fasten his shoulder holster into place. His belt is dark brown leather with a brass rounded hook-closure. Note how Clyde’s belt hangs low under his vest bottom. What’s that all about? Rather than plain white, Clyde’s shirt is a very light cream that pairs nicely with his brown suit without creating too much of a stark contrast. Like his other shirts in the movie, it has a large point collar, front placket, and single-button rounded cuffs. Clyde’s tie is certainly the loudest part of his outfit, although it is mostly covered up by the high-fastening waistcoat. The tie is dark green silk with large yellow polka dots, tied in a tight four-in-hand. It’s not very subtle, but it’s still better than some of the loud “kipper ties” favored by men of the era. You can pick up an affordable and similar tie at Bows-N-Ties for less than $15 (link). Clyde celebrates another well-executed getaway. Clyde wears the same dark brown and white leather perforated wingtip spectator brogues with dark brown laces that he sports through much of the movie. His black socks provide a noticeable contrast between pant leg and shoe, which many men try to avoid by pairing their socks to their trousers. It ain’t easy being a bank robber. On his head – and briefly, on Bonnie’s head – is a well-worn off-white straw Panama hat with a wide black band and a pinched crown. This is another part of Clyde’s wardrobe that we’ve seen before, carried over from the dark blue pinstripe suit worn through most the film’s first half. 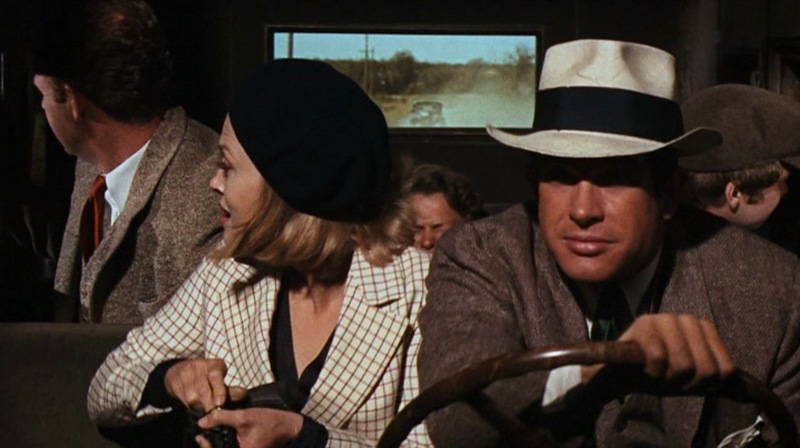 The gang fills their various roles: Clyde intently drives, Bonnie reloads, Buck and C.W. fire out the back windows, and Blanche cowers and shuts off her senses to the criminal activity around her. Clyde carries his .38 in a light brown leather shoulder holster fastened just under his left armpit for a right-hand-draw (RHD). 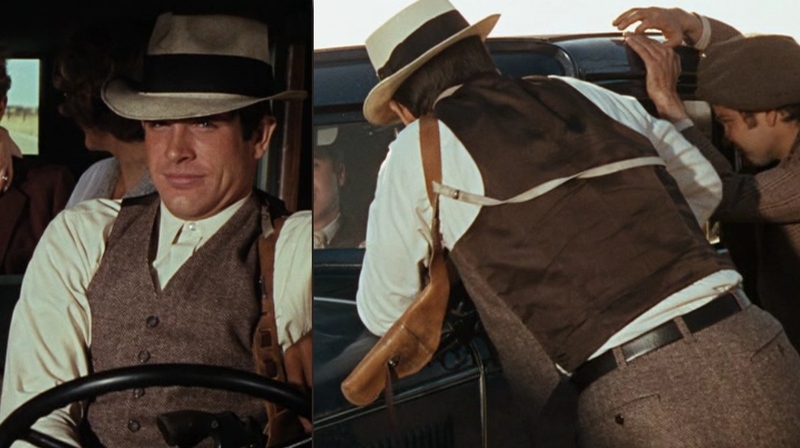 The holster slings over his left shoulder with a thin, off-white canvas strap hooking it around the right shoulder and across the back with silver-toned metal tips and snaps. Six dark leather loops down the left chest are meant for carrying individual ammunition rounds, although Clyde doesn’t do this. The holster itself is for his Smith & Wesson .38 “Military & Police” revolver, either with a 4″ or 5″ barrel. After the robbery is over, Clyde shamelessly carries around his holstered .38. Unseen in this sequence, Clyde’s underwear is pretty standard for the era: a white ribbed sleeveless A-shirt and white lightweight cotton boxers. While I can’t officially endorse bank robbery and kidnapping – no matter how light-hearted it seems – I can endorse driving around to some classic bluegrass. Flatt and Scruggs contributed their 1949 recording of “Foggy Mountain Breakdown” to this now iconic getaway scene. Although slightly anachronistic for the film’s early ’30s setting, writers Robert Benton and David Newman apparently listened to this record on loop while writing the getaway scenes. 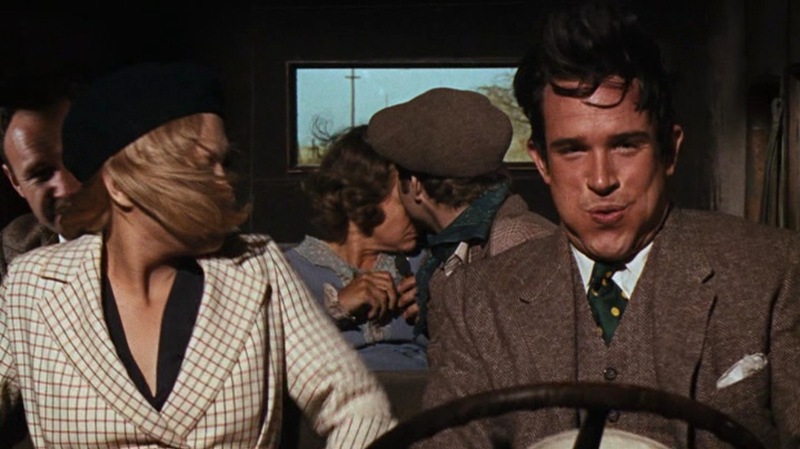 The film followed the rhythm of the writing and director Arthur Penn chose to include the song that inspired the scene. Advantage, writers! Clyde dresses like the professional country bank robber he’s always dreamed of being, obviously adhering to the maxim “dress for the job you want, not the job you have”. For the extra professional, stick a white linen handkerchief in your jacket’s breast pocket and – voila! – you’ve dandified yourself just enough with a snazzy pocket square. Things are tense inside the bank. The woman and one of the men are distracted, getting money from the cages. The other man is addressing a customer. The guard decides to reach for his gun. Now’s his chance, then – BANG! Next time, I’ll aim a little lower. Clyde stands a few feet away, staring at the guard and coolly holding his now-smoking .38. The guard’s hat, blown off of his head, means Clyde’s threat to “aim a little lower” would be deadly if carried out. Obediently, the guard surrenders with the rest of the customers. The real Clyde probably saw himself this way. Clyde’s calm admonishment in the film, while admirably, is far at odds with the real Barrow’s personality. 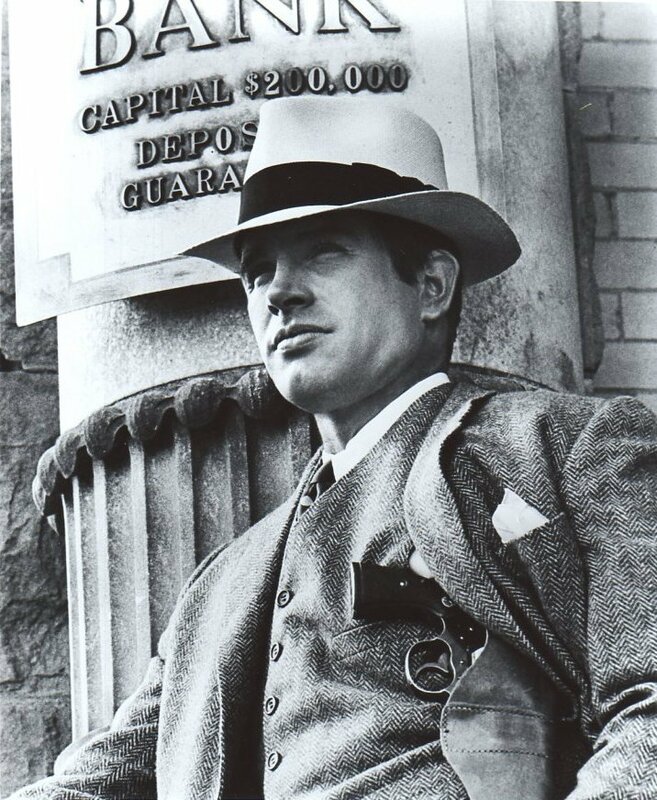 Clyde Barrow was a shoot first, shoot again, then ask questions a few hours later type. Many police officers never even had the chance to reach for their weapons before Barrow or one of his gang members was blowing him away. 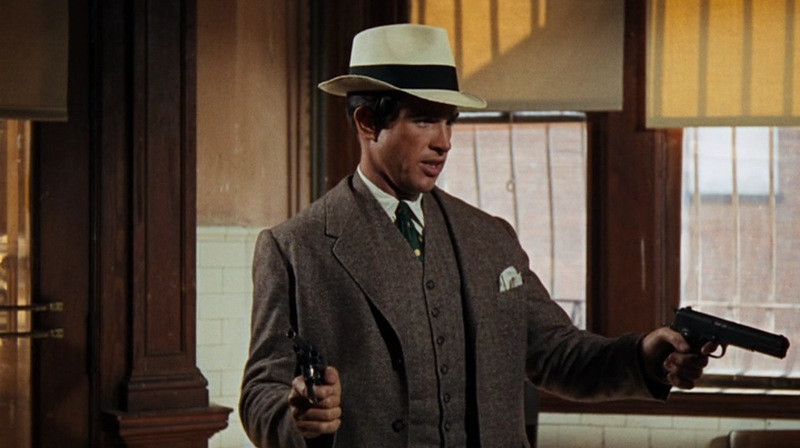 The film’s Clyde – portrayed by Beatty – is much more of a cheeky, devil-may-care Dillinger-type than the manipulative and impulsive outlaw in real life. This scene is also the only one that correctly shows Clyde using his preferred handgun, the Army’s standard Colt M1911A1 pistol in .45 ACP. The real Barrow gang stole 1911s in bulk from National Guard armories, often grabbing up to fifty at a time and stuffing them all into the back seat of their Ford. Firearm enthusiasts must salivate thinking about all of those classic, mint-new .45s… then scowl thinking about by whom they were eventually used. 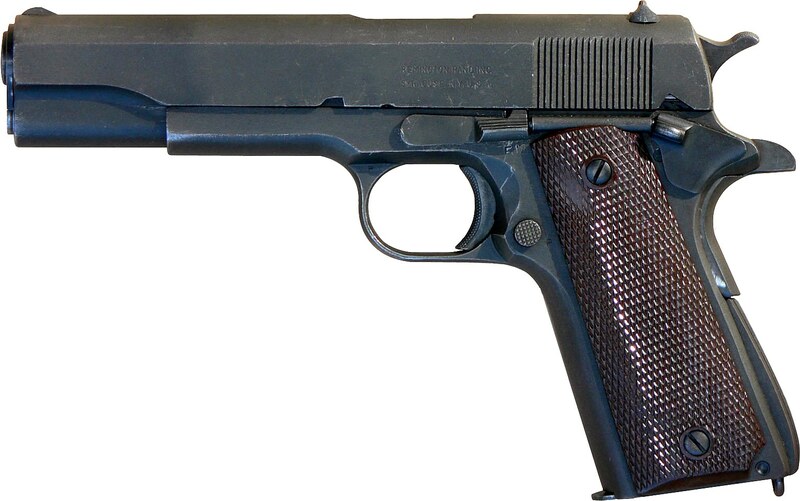 A .45-caliber M1911A1 pistol, as used by the U.S. military for nearly sixty years. 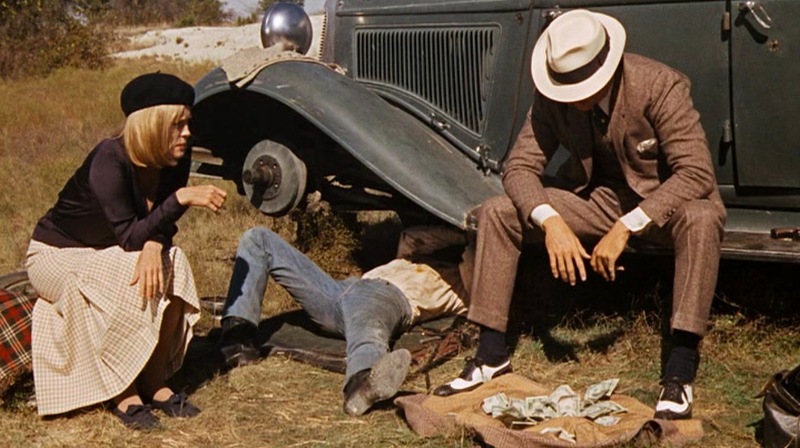 Bonnie and Clyde was a radically innovative film in every respect from narrative to technology, but it still suffered from the M1911’s stubbornness to correctly cycle blanks. While many films of the era (The Wild Bunch, Dillinger, The Getaway, etc.) armed their criminals with 9mm Star Model B pistols rather than genuine .45-caliber M1911s to get around this, Bonnie and Clyde simply chose to give their protagonists revolvers, which were far more reliable with blank ammunition. In Clyde’s case, this was a Smith & Wesson Model 10, known in the 1930s as the “.38 Military & Police Model”. However, the shot of “Two-Gun Clyde” easily taking over the Pilot Point bank with a gun in each hand gave the filmmakers an opportunity to arm him with his real-life favorite, a genuine .45 that didn’t need to be fired on screen (as the .38 could be used for the scene’s only gunshot). It’s also well-known that the Browning Automatic Rifle (BAR), which played a major part in both the outlaws and the lawmen involved with the Barrow Gang, was replaced across the board in Bonnie and Clyde by the better-known Thompson M1928 submachine gun. The 2013 two-part miniseries Bonnie and Clyde would fix this, giving Clyde predominantly M1911 pistols and BARs. Buy the movie. And do yourself an extra favor and get the Ultimate Collector’s Edition. The first book I ever had about the Barrow Gang was John Treherne’s The Strange Times of Bonnie and Clyde (Amazon), which was a good read but somewhat out of date now that thirty years of new research have passed since Treherne’s analysis. One that I have heard many good things about but still haven’t read is James R. Knight’s Bonnie and Clyde: A Twenty-First Century Update (Amazon), which sounds like it amends any issue I may have with Treherne’s book. 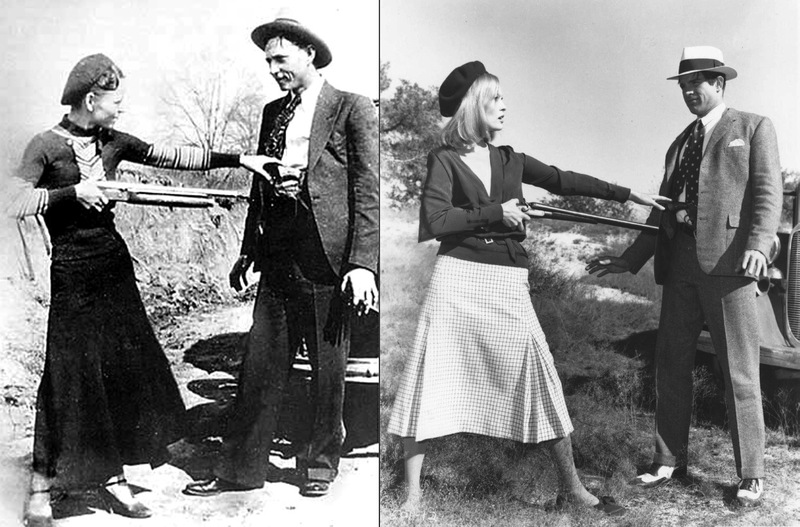 A must-see site for all Bonnie and Clyde historians is Frank R. Ballinger’s Bonnie & Clyde’s Texas Hideout. I ain’t good. I’m the best! The film’s Academy Award-nominated costumes were designed by the legendary Theadora Van Runkle, who also dressed the characters of Bullitt and The Godfather Part II.